Second single from A Secret History and last single from Setanta Records, Gin Soaked Boy was released at the end of the summer 1999. The photos represent a gin soaked boy: Neil Hannon, with his collar open and a drink of gin and tonic. Each CD represents a sketch of lemon slice. The CD1 features the radio edit of ‘Gin Soaked Boy’, a shortened version in which one verse has been cut out. The B-sides are a remix of ‘Songs of Love’ and a new song, ‘I Am’, based on a Brian Eno poem, which shows a new side of The Divine Comedy. The CD2 was a novelty at the time: besides having the usual two B-sides, it features as well the video of ‘Gin Soaked Boy’. 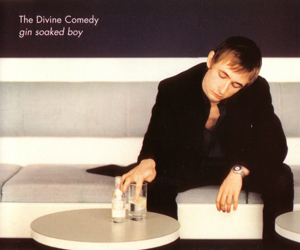 The two B-sides are not really exclusive songs, but rare songs made available to the Divine Comedy fans and that could have been on Rarities after all. The live version of ‘Geronimo’ with Yann Tiersen (recorded in a special concert in Rennes in 1998) is taken from his limited Black Session album. And ‘My Lovely Horse’ is the famous Eurovision song from the Father Ted series originally broadcasted in April 1996. Finally the MC has two songs, as always: the single itself plus a live version of ‘Europop’ at its best.